Whilst visiting the future Mother in Law at her home in the Pennsylvania woods, she brought to be what seemed to be a treasure trove of vintage patterns. What do you mean, Vintage patterns? 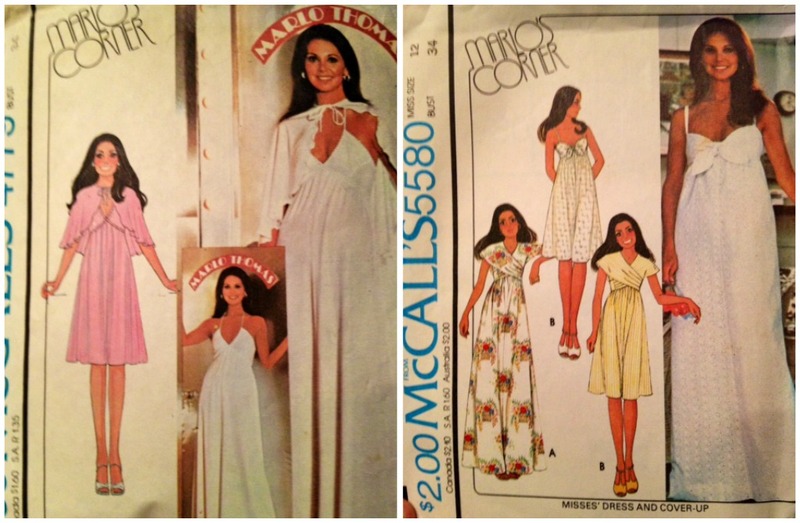 Well guys, I mean vintage patterns as in these little beauties were printed in the 60s and 70's and were, swoon, well preserved. What do you think made this situation better? MIL told me that I could have my pick of some patterns to take home and try out myself! Old patterns have a soft spot in my heart. If well preserved, these can offer a fantastic way to bring "vintage" fashion back into your life while using new fabrics and prints, therein modernizing them. 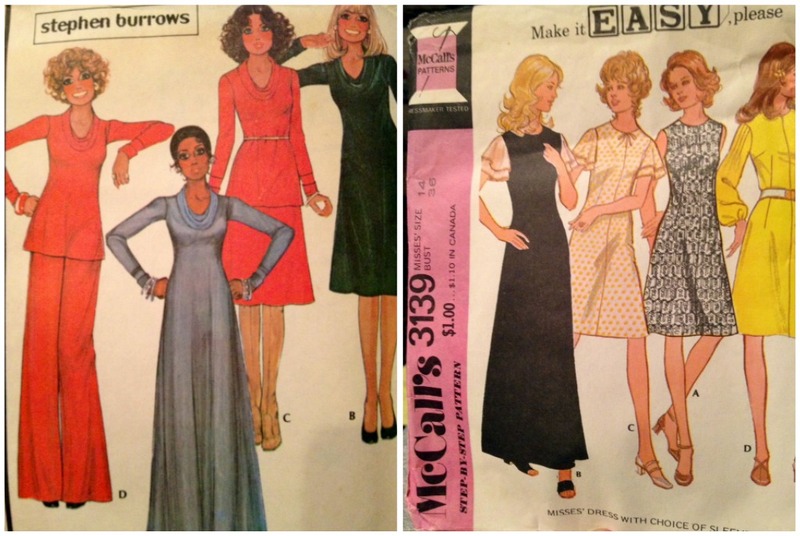 The treasures that I ended up bringing back to the homestead included the following patterns that I thought I could #1 make work in my modern woman wardrobe #2 would not be too hard to make or learn to make and #3 were my size people! The Bob Mackie (think Cher's "If I Could Turn Back Time") swimsuit and coverup patterns immediately caught my eye. I am a bit far away from working with swimsuit grade stretch but these coverups are rad enough that I could work it, girl. The Infinite Dress pattern? Well, I am infinitely excited about experimenting with this. It looks a smidge tricky but I think if I were to perfect the dress, it would be well worth the time. I only know of Marlo Thomas from the St. Jude's commercials but upon a little digging, I found that she was apparently "That Girl"... so I will consider her the equivalent to our "New Girl". That all being said, how freakin' adorable are these dresses? Caplets and wrap tops abound, I think these will be my first in line of attack. Adorable and can most definitely work with modern prints. Hello cowl necks. Now I don't know that I would wear a pair of bell bottoms and a cowl neck together (heaven forbid I look too 70's) but as separates, this could definitely add some snazz to the Amanda collection. And you know what else? Maxi dresses are in so I suppose fashion does come back around, yes? 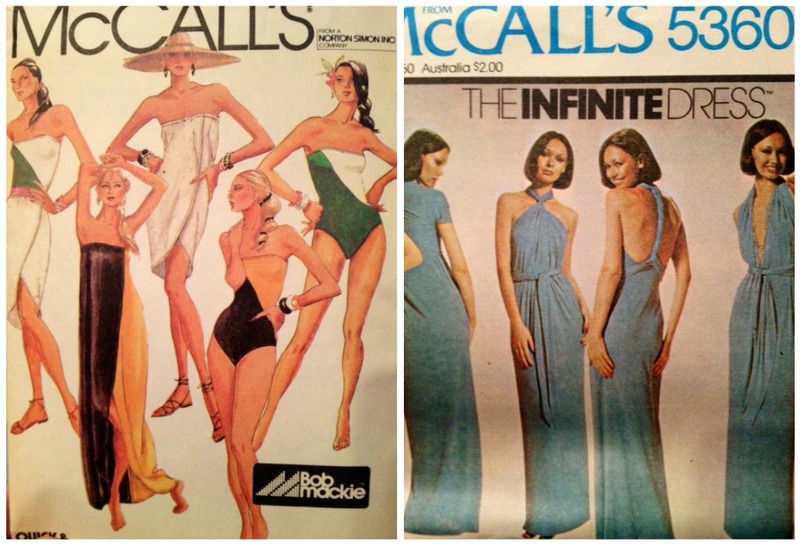 The McCall's pattern only has two dresses that I could see myself working. The sleeveless number and the long sleeve version are totally something I could imagine working professionally or in a springy, floral pattern. What do you think? Can I make them work?